One of the biggest shortcomings of many OSR (Old School Renaissance) games out there in our point of view is that it usually is incredibly hard to gain a level (due to the deadliness of OSR games) but finally actually gaining a level is a huge anti-climax (except for the personal satisfaction associated with it of course): Maybe your character will gain a couple of hitpoints, maybe become slightly better at combat (due to an increase to-hit bonus) or at avoiding harm (due to slightly improved saving throws) and that’s about it – unless you are a spellcaster. Can you spell booooooring? The same holds true for younger versions of the game – first and second advanced editions didn’t do much to alleviate this. One of the biggest achievements of the third edition of the granddaddy of all RPGs in our point of view was the idea of making every level advancement exciting or at least interest because something special would happen. The biggest third edition answer to this problem was the introduction of feats and (fiddly) skill points (besides more class abilities). Another problem persisting in all editions of the original game as well as in most (all? not sure, there are so many) OSR games is that race selection usually only matters during character generation. Once you have selected your race you get a couple of one-time bonuses. As those bonuses are applied at level one, they are of low power – which means that their usefulness decreases with increasing levels. Thus races – instead of being a defining feature – deteriorate into some kind of side note the more levels you advance (roleplaying aside – we are talking game mechanics here). ADOM RPG takes the following design stance to the problems explained above (for each of the levels up to 36 supported by the rules). We see levels 1-9 as the most interesting ones where most campaigns will take place and regard levels up to around 14-16 as a sweet spot for gaming (because later on game styles usually become very different because the players have turned into powerful political figures). Thus we put a focus on a slightly increased rate of enhancement during those early levels and slow down enhancements later on. Still at every level something meaningful happens. And your choice of race plays an important part in this. We find distributing skill points once per level too fiddly. A later blog post will describe our take on a fast and flexible skill system. Nonetheless gaining a skill level is one of the things that might spice up level advancement in ADOM RPG. In ADOM RPG you gain one free skill advancement every even level (2, 4, 6, …). We do not use feats. Instead each race and class has special levels at which new or better abilities related to the race or class are gained. For races the level numbers at which a new or improved racial ability is gained are fixed: This progress starts at level three and you gain one racial enhancement every four additional levels (so the progression is 3, 7, 11, 15, 19, 23, 27, 31, 35). For classes the enhancement levels depend on the individual class. Otherwise each class also adds special abilities at defined levels. We like the idea of attribute scores not being totally static. You can increase one attribute by +1 at levels 3, 5, 7, 9 and then every fourth additional level (13, 17, 21, …). Hitpoints are only rolled for at levels 1-9. Afterwards you receive a fixed HP bonus (without Constitution adjustment) to make the game scale better to higher levels (more on this in a later blog post). The Base Attack Bonus (BAB) also gets increased over time, as well as saving throws. The first three enhancement types already ensure that something special is going to happen at every level from 2 to 36. With the addition of class powers, hitpoints, base attack bonus and saving throws a lot more is going on. As all enhancements are either determined by general level, race or class advancement is a lot less fiddly than in third edition and yet feels meaningful and important at each and every step. The biggest new feature in ADOM RPG relating to the importance and fun of level advancement probably is the idea of gradual increases in power due to your race. Third edition of the game sported the optional idea of racial class levels but in our point of view the tradeoff to taking a class level usually was too big for that to be an interesting option. In ADOM RPG we thus decided to over time add more and more racial flavor. 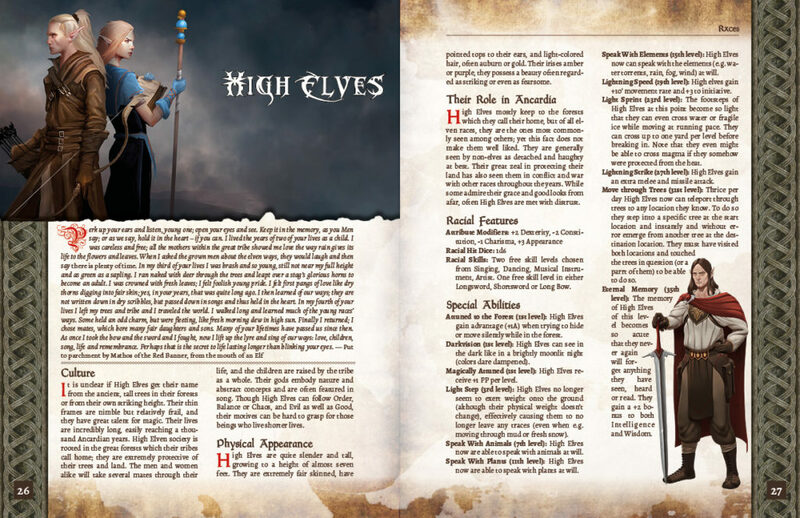 High Elves start out with some minor yet useful special abilities (advantage on stealth checks in forests, darkvision and a minor Power Point bonus). As the character advances in level they become more and more powerful and flavorful (later on being able to speak with animals, plans and the elements; becoming traceless and even able to sprint over thin ice or water, lightning speed and so on). This helps differentiating high elven characters from any other race but still is a simple mechanism as you do not need to choose from a huge catalog of capabilities. Rather your initial choices matter for the lifetime of your character. Or in other words: Your character becomes more and more high elvish the more (s)he advances! Archers in the beginning hit better and harder than other fighting types when using missile weapons and they can quick-draw their missile weapons. Later on they learn more and more ranged special abilities, gain extra missile attacks and learn lots of missile weapon related skills. Again advancement is pretty simple as there is no huge catalog to choose from – but your archer character definitely will be different from fighters specializing on missile weapons (not to mention more distant classes). You check your class(es) to see if you gain new special abilities. You check your race to see if you gain new special abilities. You check the general advancement table to see if you gain extra skills, attribute increases, etc. Fast yet interesting. And with meaningful choices (as you will see when we e.g. elaborate the ADOM RPG skill system in a future blog post). Let us hear your feedback on this! P.S. : For people interested in the upcoming Ultimate ADOM computer game these posts also matter as many of the design ideas will factor into the game (even though the mechanics might be different ones to account for the computer game context). 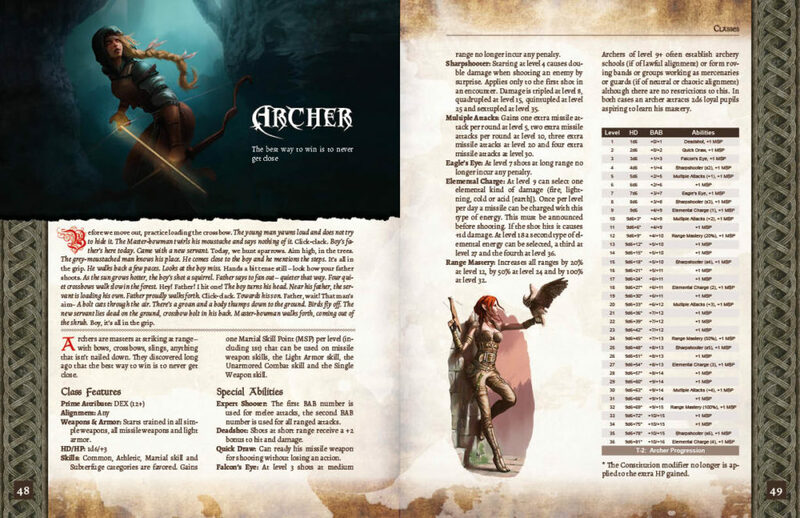 Previous Post: Why yet another D&D clone? 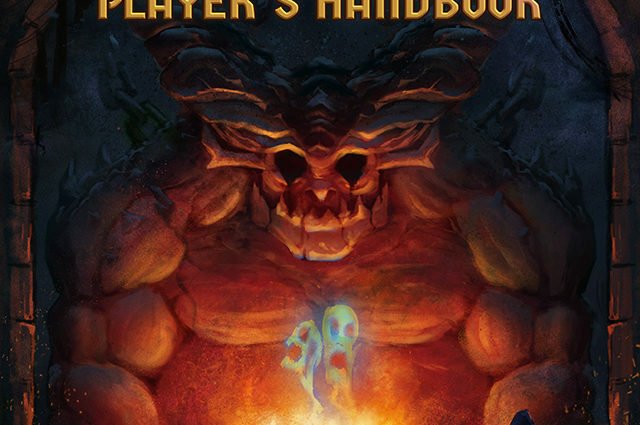 Would it be possible to include the pages from the rulebook in higher resolution – they are hardly readable in the current format/resolution? Please try zooming into the web page (Ctrl-Plus or Command-Plus depending on your system). It’s not perfect but should work. Sadly my current WordPress installation severely limits the possible file size and I yet have to get this fixed somehow. So for I can’t post things in a higher resolution. I love it! Fiddliness is a complete turn-off. Thanks! Same for me these days! Time comes at a premium and having a fast and furious system is king for us! Are racial hit die rolled at levels 1-9 along with class HD or is the racial hit die only rolled at level 1? The racial HD is only rolled at level 1. So adventurers basically start with 2 HD, one from race, one from class. While I can understand your problem with many OSR systems, making leveling up exciting was never their intention. After years of seeing core rule books increase in size and detail, some players wanted to go back to the old days, having some nice dungeon crawl with minimalistic rules, a 10 foot pole and social conflict role-played out. The biggest difference between 3rd edition D&D and B/X is that fact that it handles combat as sports and not as war. This makes a huge difference in gameplay style. OSR is combat as war! What you’re doing here is writing a heartbreaker system. Taking the D&D basics and changing its rules to your liking. That is perfectly fine, some heartbreaker systems are a great addition to the hobby. But OSR it is not.